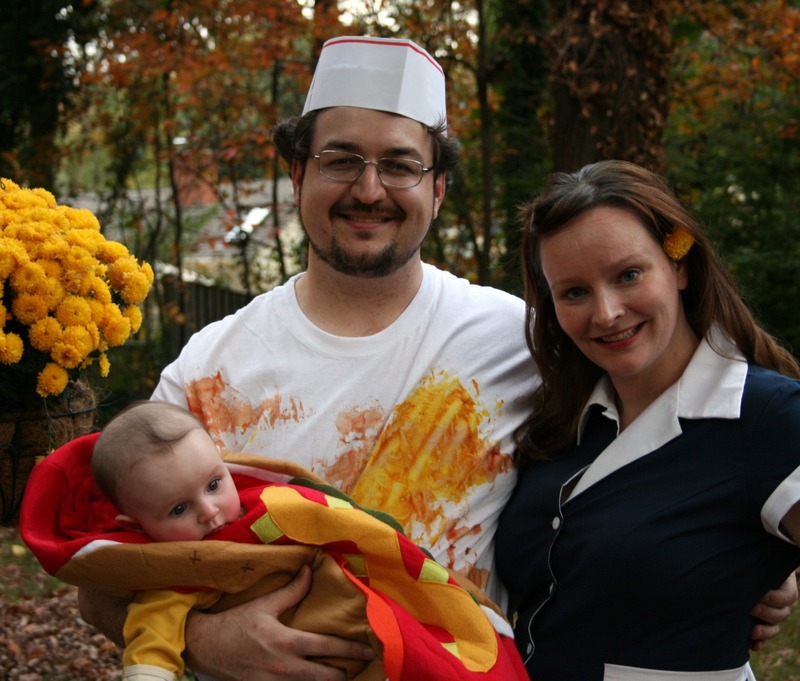 Happy Halloween from Capital Spice! Best BBQ in the Country? We actually agree with Zagat. Zagat just released the results of its latest restaurant survey, including customer choices of the top five restaurants in each of 45 markets nationwide. Of the 675 restaurants named as the top five in each of these markets, there was only one barbecue restaurant: Oklahoma Joe’s in Kansas City. 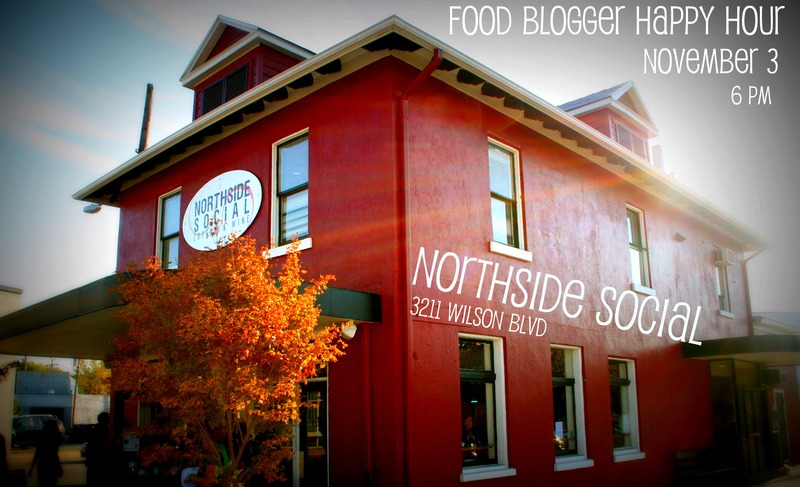 Northside Social-izing: Food Blogger Happy Hour and Cookbook Swap Next Wednesday! It’s getting to be that time again. The monthly DC Food Blogger Happy Hour is set to take place next Wednesday, November 3rd. It’s the day after the elections, so you’re going to have a reason to come out for a drink regardless of which party you support. And we’re here to support that. So is Northside Social. The neighborhood coffee house / wine bar / all-around enjoyable place to hang out is this month’s location, and we’ll have the back room reserved to give us room to get the party started. If I know this group, we’ll be spilling out into the rest of the space before too long. Why Northside Social? Well, it IS our November Happy Hour. We wanted to pick a place that offered some cozy warm beverages in case next week is more seasonably cold. But we also wanted a spot with some solid beverage options as well. General Manager and Sommelier Alison Christ has certainly seen to that, compiling a wine list that should offer something for everyone (and some choice beers for those who just don’t like wine). And because the holidays are rapidly approaching, we wanted to try something new and (we hope) fun for this month’s happy hour: a cookbook swap! Have a favorite cookbook you’ve worked your way through backwards and forwards? Got a book you’ve been meaning to cook from but you just haven’t gotten around to it? Bring it with you to Northside Social and trade it for another. We’ll have a table full of cookbooks for everyone to pick and choose from. Bring one book, take another home. Bring two, take two. It’s a great way to refresh your cookbook collection and see what your fellow foodies have been cooking at home. We’ll kick off at 6 PM, as usual. Northside Social is located in Clarendon, just a short walk from the Orange Line’s Clarendon Metro stop. Head in the opposite direction from Hard Times Cafe along Wilson Boulevard, and you’ll pass a couple of additional foodie destinations: Eventide, Spider Kelly’s and Liberty Tavern (owned by the same folks who bring us Northside Social and Lyon Hall). If you’re planning to come by, take a second and let us know on the event page over at Facebook. And if you still haven’t joined the group, sign up to become a member of the DC Food Bloggers Facebook group. It’s a great way to hear about each month’s happy hour as well as other fun events that come up from time to time. Any questions? Drop us a comment or ask on the event page. We can’t wait to see you there…and Baby Spice may even make an appearance to sweeten the deal. 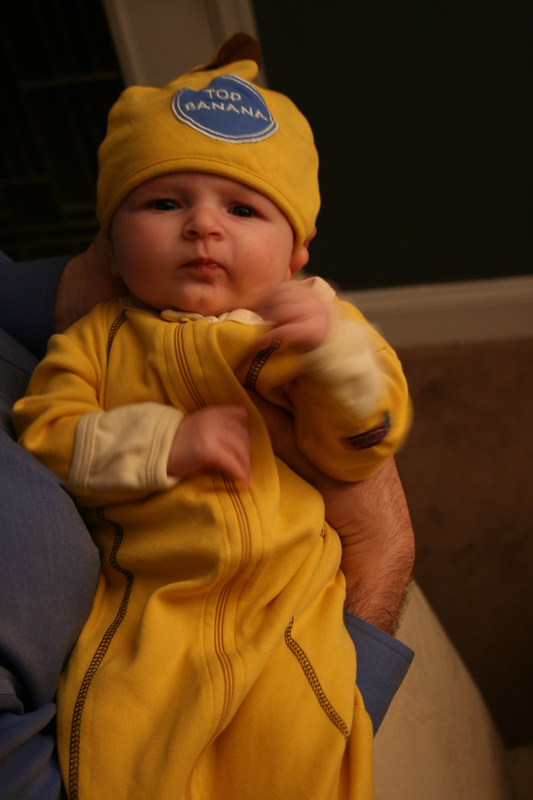 Sorry we’ve been a little MIA lately. We have a new roommate. She’s keeping us up at all hours. 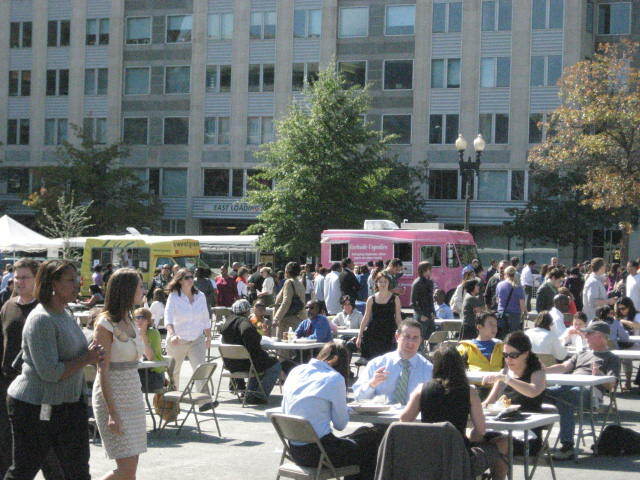 When it comes to food trucks, DC is quickly earning a place as one of the most diverse and delicious cities across the country. We’ve got Maine lobster rolls, Cuban sandwiches, Canadian poutine and Korean BBQ tacos – even food from the Fojol brothers’ native “Merlindia!” On any given weekday a lunch crush could be gathering just outside your office for a taste one of these or a dozen other concepts. But not yesterday and today. 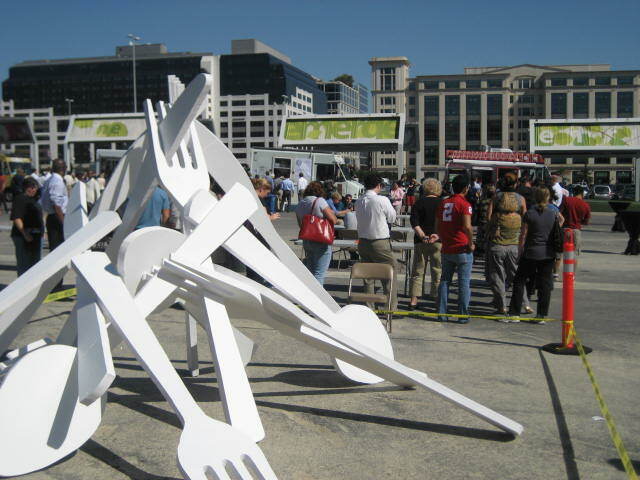 With the first annual Curbside Cookoff, Washington’s Department of Consumer and Regulatory Affairs brought them all together in the parking lot at 11th and H Streets, NW for a snacking summit of epic proportions. Voters selected their twenty favorite vendors from those who sell in the DC metropolitan area, and they all received invitations to set up at the site of the old convention center for two days of food and fun. Yesterday’s crowds were a testament to just how popular these food trucks have become – an estimated 8500 guests waited in lines that sometimes exceeded an hour just to taste some of the favorites. We stopped by for a quick look around in the early afternoon, and some of the vendors had already sold out for the day. They’ve promised to reload and come back ready for twice as many people today. Chicken Nuggets Are Made From This Pink Goop. Why no. That is NOT strawberry soft serve fro-yo. When we woke up from our Top Chef-induced food-TV coma last week, we realized that we forgot to save room for dessert! Top Chef: Just Desserts has been on for three weeks now. It’s hosted by Gail Simmons and it even features a local competitor, Hook’s Heather Chittum. How could we ignore it? If you’ve ever dreamt of walking away from your day job and getting into the restaurant business, Chittum should be an inspiration. She came to Washington from New York to work on the Hill. After four years she took a job with Share Our Strength, and then in 2001 her passion led her to L’Academie de Cuisine in Gaithersburg. She has since built a reputation as one of the top pastry chefs in the Washington metropolitan area, winning the award for Pastry Chef of the Year from the Restaurant Association of Metropolitan Washington in 2008. We caught up with Chef Chittum last Friday and talked about pastry chefs in the spotlight, the interplay between entrees and desserts, and – of course – whoopie pies.